Nick Gillespie discusses the difficulty artists have had grappling with 9/11, and suggests two that did a particularly good job. I was not familiar with the Elton John performance and it did not really move me seen today out of context from its original airing. But I did see the documentary "Man on Wire" and think it's fabulous -- the world is made better by peaceful eccentrics and Philippe Petit's story of walking a tightrope between the twin towers is amazing. It should be noted that he developed his overpowering vision of walking a wire between the two towers before he had ever once climbed on a tightrope. I would like to add one more successful artistic treatment of 9/11 -- the Onion's 9/11 issue. The issue was in its way as brave as Petit's tightrope walk, as it came out when no one was joking about the tragedy (hell, no one really attempts to address it with humor to this day). 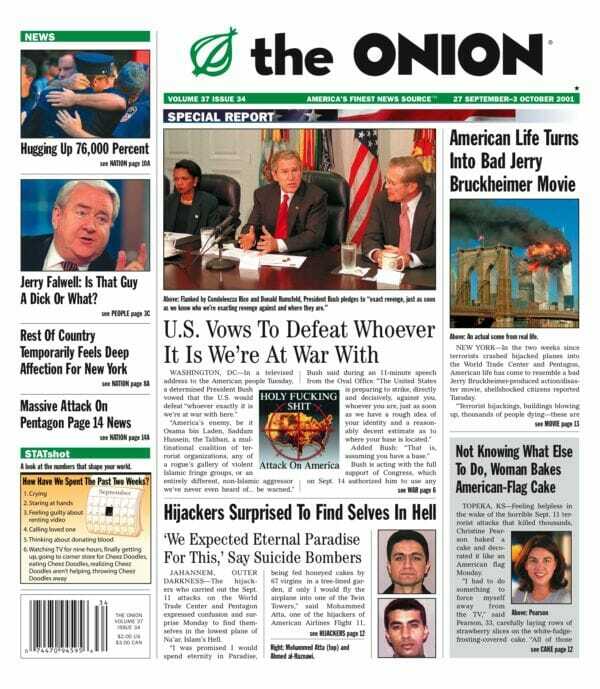 But the Onion staff put out an amazing issue that was both funny and respectful and a spot-on tribute. The entire archive is here, keep scrolling some of the best are at the bottom. But even the small throwaway details are great -- who else in September of 2001 could have written the (likely spot-on) headline "Rest of Country Temporarily Feels Deep Affection for New York"? And perhaps it is just me, but I still laugh at stuff like this, particularly in this age of virtue-signalling. NEW YORK—Nearly two weeks after the attacks on the World Trade Center and Pentagon, the makers of Dinty Moore beef stew finally weighed in on the tragedy Monday with a full-page ad in USA Today. "We at Dinty Moore extend our deepest sympathies to all who have been affected by the terrible events of Sept. 11, 2001," read the ad, which pictured a can of Dinty Moore beef stew at the bottom of the page. "The entire Dinty Moore family is outraged by this heinous crime and stands firmly behind our leaders." Dinty Moore joins Knoche Heating & Cooling and Tri-State Jacuzzi in condemning terrorism. For those who are younger and don't remember the day that well, the last article may seem a little random, but one of the odd reactions one heard everywhere on 9/11 was people saying that the jets ramming the towers and the later collapse of the towers all looked like a movie, like things we only expected to see in special effects and not in real life. Speaking of movies, I was in Manhattan that day -- in the championship of bad timing awards, I was scheduled to make a presentation at 9am on 9/11 to a group of investors asking them to invest in our commercial aviation internet venture, making the pitch that the commercial aviation industry (which had been slumping a bit) was poised for a turnaround. Anyway, one thing I have never seen reported much is what Manhattan was like that night. I was stuck in the city, planning to leave the next day in the last rental car available. I was wandering the city looking for dinner, happy I suppose to have been only lightly touched by the disaster, not knowing yet that several of my friends from business school had died that morning. The authorities had been letting everybody leave the island through the bridges and tunnels, but no one, not even taxis or public transportation, was being allowed back in. By the evening, the city was deserted, like a scene out of a post-apocalyptic movie. Perhaps one car every 10 minutes came through Times Square. The quiet was astounding, probably the quietest the city had been then or since for 200 years. The Florida auditor sitting in my one-man office was shocked to learn I would not be in the rest of the week. I said you scheduled the audit visit for today, so I changed my plans and am in the office today, but leave tomorrow. Apparently she assumed that the audit schedule gave her the right to stay as long as she wanted. She was planning to sit in my office for another 2-5 days. I told her sorry, but if she wanted to book 5 days, she should have booked five days. And by the way, if she had tried in advance to make me sit dormant in my office all week, I would not have agreed to the visit. This is just insane in an Internet world. Everything she asked for in advance was sent to her electronically. Even though she is sitting right next to me, her requests to me for more data have come by email. I can't figure any reason why she is even here, unless Florida finds it cheaper to fly her around and use other people's offices rather than provide her with one of her own. By the way, this is fairly typical of a lot of government workers in my experience. If they block a meeting on their calendar for the whole afternoon, they want it to last the whole afternoon. There are a lot of jobs out there where people are most comfortable proving their worth by showing that their calendars are always full. Circle K Southeast joined a growing list of national companies shifting workers to part-time status this week, in order to avoid paying Obamacare’s mandatory benefits, CBS-WTOC reports. The alternative is to pay a $2,000 fine per fulltime worker who is not covered, leading Circle K to become the latest in a long line of companies to slice employee hours to avoid increased costs. Here was my article several weeks ago in Forbes, though I have been predicting this since last year (when my own company started planning for the same change). I often tell folks that while the taxes in California are irritating, what has really killed my interest in expanding in California is the regulatory burden. It took 3 years to get through Ventura County planning department to get permission to put a modular ticket booth in a corner of an existing parking lot -- only to be denied. I have faced potential prosecution because we demolished an unsafe deck without state permission. I now have to fire people who try to work through lunch or else face employees suing me (successfully!) later for their voluntarily working through lunch. I think that is why I enjoyed this blog, SLO Leaks, so much. It is a 3-1/2 year story of an obviously wealthy gentleman trying to get the local planning board and later the California Coastal Commission to allow him to build a house on his residential-zoned land. I sat up for hours last night reading through it. 42 months and $3 million later, he still is not even close to having his approvals. It is interesting to see his respectful-of-authority tone shifting over time, until at the end he is writing about how he has shifted his company's new office and expansion from California to Texas. One single family residential permit was issued during the entire year. That’s it. No commercial buildings, no office building, no barns, just one single family house permit. And it wasn’t my permit, that’s for sure – because I am now going through the potentially years long Coastal Commission permit appeal process before I can even apply for a building permit. So after waiting nearly a year, Daniel Robinson, who is a low level bureaucrat with the California Coastal Commission, and who had never even been to the house site, and who had never even met me or my wife, has told me that he doesn’t like my front yard, he thinks the retaining walls are too big, he thinks my house is too big, and that he doesn’t like the overall design of my house. Daniel thinks that my house should look more like a farm house, and also that people walking around in the city of Pismo Beach will be offended by the mere sight of my house (so called “visual impact”). And if my house design doesn’t please him then he will recommend to the full Coastal Commission that they deny my permits. Since I will only get 3 minutes to defend my house in front of the Coastal Commission I would then probably lose that permit appeal vote and I will be unable to build my house at all, and I will lose about $3 million, and will have wasted years of my life. But then there was the minor issue of a permit for Daly City, a suburb of San Francisco, to rebuild a rock retaining wall that had been damaged during the last winter storms. It was such a minor issue that Daley City didn’t even send a representative to the CCC meeting. What could possibly go wrong? The rock retaining wall was to protect a dirt and gravel road that follows along the coastline. On the other side of the dirt road is an abandoned landfill that Daley City capped over in the 1970′s. And I watched the Coastal Commission, apparently on a whim, decide to overrule their staff and instead of issuing a permit they decided to require Daily City to dig up the entire landfill and relocate it inland somewhere. Where it got relocated to the Coastal Commission didn’t care – since that isn’t their problem. And the estimate to do this landfill relocation is $125,000,000.00! $125,000,000.00 works out to $1250.00 for every man, woman, and child in Daly City. And the Coastal Commission decided that this must happen with about 10 minutes of discussion amongst themselves and without a single fact to cloud their minds! It was both unbelievable and terrifying. Unlike me, Steve’s appeal to the Coastal Commission went pretty smoothly. He had his hearing in only 8 months – start to finish. It has taken me a year and a half, after waiting a year and a half for SLO County to issue the permit in the first place. And there were no onerous “Special Conditions” imposed on Steve by either San Mateo County or the Coastal Commission. Here is the list of “Special Conditions” that the Coastal staff wants to impose on me. Superficially Steve’s house and my house are similar. I have a main house and a barn on 37 acres, Steve has a main house, two barns, and a farm labor house. But Steve’s house is 15,780 sq. ft., with a swimming pool, and a 2,500 sq. ft. barn, and another 3,040 sq. ft. barn 31 ft. high, and a 1240 sq. ft. farm labor house all on 261 acres. So Steve’s house is around 3 times larger than my proposed house (and much taller). Steve also got to have a fence and there was no requirement for public access. And Steve was able to build his house to look anyway he wanted. No “rural agricultural theme” architecture for Steve, that’s for sure. Steve can also plant in his yard pretty much any damn thing he wants. Steve is pretty proud of his house. A picture of his house is the banner to his web page, which ishere. You can see the front gate of his house here. And this is an overhead view. Steve Blank is one of the current California Coastal Commissioners. I wasn't planning on watching the debates, but my wife made me watch the first 20 minutes. Is this really what passes for political discourse in this country? I was particularly struck by the appeals to unnamed authorities -- both candidates said something like "I saw a study the other day [unnamed] that said my plan was great" or "your plan was bad." Seriously pathetic. And, after the corporatism and cronyism of the last 8+ years, the fact that Romney could not explain why it made sense to cut tax rates but eliminate deductions just convinced me he deserves to lose. He was losing to class warfare rhetoric on tax cuts, when he should have been taking the high ground, even with the occupy wall street folks, saying that it was time to stop tilting the tax code towards special interests and populist fads at least one of which -- the tilting of the tax code to home ownership -- helped drive the recent economic downturn. I blog and don't tend to debate in real time, because I always think of great quips hours later, but even I had the perfect rejoinder for Obama in real time when he said, "I think we should return to Clinton era tax rates, when the economy was great and growing." Romney should have said, "If I am President, I will happily work with Democrats to do just that, as long as they agree to return to Clinton era spending levels. After all, if government policy during that era was really so perfect for the economy, then spending levels must have been appropriate as well." I don't plan to watch any more of this garbage until and unless they include someone other than the Coke and Pepsi candidates. I'd like to see Gary Johnson but heck, even adding a Marxist would probably help.